Lightning McQueen (Owen Wilson), a hotshot rookie race car driven to succeed, discovers that life is about the journey, not the finish line, when he finds himself unexpectedly detoured in the sleepy Route 66 town of Radiator Springs. 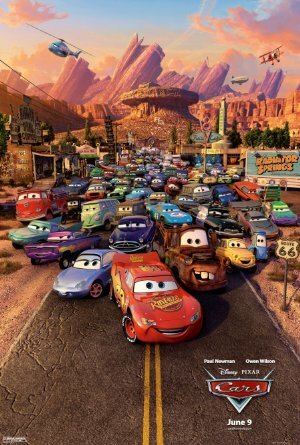 On route across the country to the big Piston Cup Championship in California to compete against two seasoned pros (Richard Petty, Michael Keaton) , McQueen gets to know the town's offbeat characters--including Sally (Bonnie Hunt), a snazzy 2002 Porsche, Doc Hudson (Paul Newman), a 1951 Hudson Hornet with a mysterious past, and Mater (Larry the Cable Guy), a rusty but trusty tow truck, who help him realize that there are more important things than trophies, fame and sponsorship. 74/79 on RT, 3 starts from Roger Ebert, ages 5+ and 4 stars from Common Sense Media. This is viewed as one of the second-rate movies, but I really enjoy it. The scenes of the American West, and straightforward growth-and-redemption storyline, and also the racing action. I understand there are STRONG FEELINGS about the Cars universe here on MeFi, and I think it's best viewed as allegory, like Gulliver's Travels. I think Ratatouille, Up, The Incredibles, and Toy Story 2 are far better movies - but goddamn if Cars isn't the most rewatchable Pixar movie out there, and I don't even have kids. I think I've only watched Master and Commander more. There's something very satisfying and comfortable about the atmosphere and story beats, even if it's all very much by the numbers. Sally was Bonnie Hunt?? It was a long time ago but I always thought Sally was Julia Louis-Dreyfus. See this is why I need to bring along a cheat sheet to the theatre. Doc Hudson's voice was driving me crazy. I couldn't concentrate on the screen for trying to figure out that voice, it's just so familiar... and that's with a cartoon character that actually looked like Paul Newman. The only voices I got right off were The CarTalk guys. This movie is totally KA-CHOW! I've come around on this movie after watching it a million times with my kid. Being heavily influenced by Doc Hollywood makes it less original than most other Pixar movies, but it also makes it very different from other Pixar movies. It is just a nice, relaxed movie with some fun bits. I've come around on this movie after watching it a million times with my kid. Same thing here. Perhaps it's some form of Stockholm Syndrome, but I actually like the Cars movies. They're less original than other Pixar movies, but I find them much more rewatchable for reasons I can't really explain. Simpler, more relatable characters (for younger kids anyway)? Also, the toy cars are gorgeous with extremely fine decals. I hadn't noticed that Chick Hick's main sponsor was called the Hostile takeover Bank before I bought the toy for my kids. I also love Cars, although I refuse to believe that Bob Cutlass doesn't know that Lightning McQueen is learning life lessons in a small town; Bob Cutlass's bread and butter is feel-good stories about athletes in small towns learning life lessons. I watch this movie as a guilty pleasure to see how the world evolved in the "Trucks/Maximum Overdrive" universe after the machine uprising. To me, it explains why they have door handles, DinoCo, steering wheels, etc. Glad to see they all got along post-struggle and pacification. I have a huge soft spot for Cars, which I've gone into for other discussions on the blue, and won't get into here. It's an animated Doc Hollywood, which I always thought was kind of funny (make a highly popular animated film out of a forgettable Michael J. Fox vehicle). For the longest time I only knew the beginning of the film because I would set my oldest up in front of it on a weekend morning and stumble back into bed and he would wake me up at the end credits so I could make breakfast. But one morning I actually sat and watched it with him, and I was impressed by the ending. McQueen has everything he's ever wanted in his grasp, and gives it up to go help out the old, broken champion cross that finish line for the final time. The race, which has been built up since the beginning of the film and been presented to the audience as an amazing spectacle of animation and pacing and everything else, suddenly ceases to mean anything in the moment of the crash - which is a really wonderful piece of cinema, because it makes the audience and McQueen of one mind in that moment. It's great. The ending reminds me of Rocky in the way that by the time you get to the end of the film, it doesn't matter who won or who lost. I think there's criticism of the film for the fact that it extols the "good ol' days" as the way things should be, but I've always thought the message of the film was more subtle than that - it's about respect and honor, about the fact that winning isn't important, but how you go about life. These are the things that sport is supposed to teach (how many defenses of character building do we hear?) but all too often doesn't always seem to - enough that when there are moments of sportsmanship and respect in the various professional leagues they become notable, as opposed just part of business. Anyways, Paul Newman as Doc Hudson is magnificent, as is Owen Wilson as Lightning. We still have many of the toy cars this film spawned because not only are they beautiful, they are really well built and solid. The VW beetles as flying bugs, the tire track contrails, the Stanley Steamer as town fountain... it's the details that makes this so good to rewatch.